SCSI-IDE Converters: Affordable, high SCSI Capacities with IDE drives? IDE instead of SCSI drives! SCSI drives are more expensive than IDE/ATAPI or UDMA33/66/100 harddrives. If it comes to 18GB or up, the price difference between IDE harddrives and harddrives with UltraSCSI-2 or UltraWideSCSI interface could become 100% and much more. 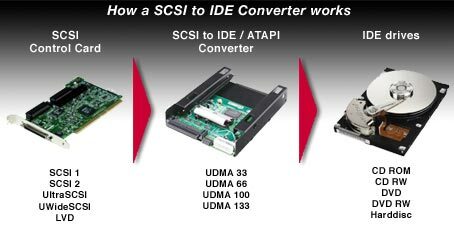 Now there is a solution that allows the use of cheaper IDE/UDMA drives instead, using special IDE to SCSI converters. These converters could be used with any IDE, ATAPI or UltraDMA drive to achieve affordable SCSI storage solution in enviroments, where SCSI is the only or better solution. The converters are available in different versions that connects direct to the 40pin IDE/UDMA Interface of the drives or fits under the drives to avoid possible space problems in special systems or removeable racks. 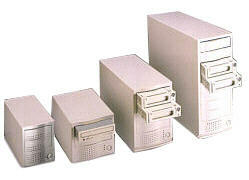 Complete kits including harddrives and external SCSI(IDE) stations are available as well. The HighPerTEC SCSI-ExTerminators are available with 5,25" removeable drivekits that accomodates 3,5" IDE or UltraDMA 33/66/100 harddrives. 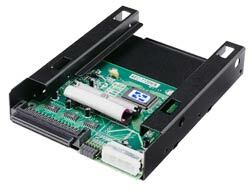 The removeable kits can be used in external SCSI enclosures as well or internal in 5,25" drive bays from PCs. 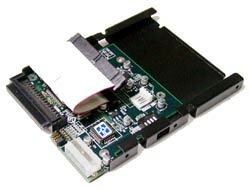 The converters could be used with other drives such as CDs, CD-R, DVD, LS120, ZIP and other IDE, ATAPI and UltraDMA drives. All converters are working independant of the operating system without any software or device drivers on any standard SCSI controller, MACs, workstations and other systems with a SCSI interface. Professional video and audio systems (ex. Casablanca) can use this cheap solution for high SCSI capacities as well. No software or drivers needed. Works with any operating systems: DOS, Windows (alle), Unix, Linux, Novell, OS/2 a.s.o. The LVD 3 SCSI-IDE bridge is dedicated as general-purpose bridge of SCSI (Small Computer System Interface) to IDE (Integrated Device Electronics) interface. The LVD 3 SCSI-IDE bridge supports most platforms and /or Operation System including PC Windows 98/ME/NT2000/XP and Linux platforms. SLVD SCSI-IDE bridge is dedicated as general-purpose bridge of SCSI (Small Computer System Interface) to IDE (Integrated Device Electronics) interface. The LVD SCSI-IDE bridge supports most platforms and /or Operation System including PC Windows 98/ME/NT2000/XP and Linux platforms. LVD SCSI-IDE bridge is dedicated as general-purpose bridge of SCSI (Small Computer System Interface) to IDE (Integrated Device Electronics) interface. The LVD SCSI-IDE bridge supports most platforms and /or Operation System including PC Windows 98/ME/NT2000/XP and Linux platforms. 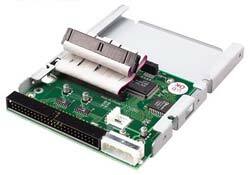 SCSI-IDE converter mounts direct on 40pin interface of the drive (harddrive, CD, CD-R, DVD, LS120, ZIP) and connects to any 50pin UltraSCSI controller. SCSI-IDE converter mounts under any 3,5" IDE/UDMA aharddrive and connects to any 50pin UltraSCSI controller. This space saving version could be used together with the harddrive in (the drawer of) standard IDE removeable drive kits. 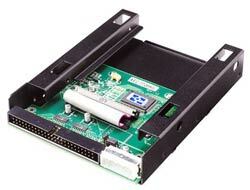 SCSI-IDE converter mounts under any 2,5" IDE/UDMA Notebookdrive and connects to the special 50pin UltraSCSI controller (NB-version). This space saving version could be used together with low profile IDE/UDMA harddrives in notebooks such as older Apple PowerBooks. More applications are as a replacement for high power 3,5" drives used in industrial control systems with space limitations, measurement control or battery driven systems, where low power consumption is a must. 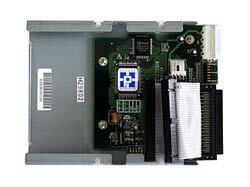 The Ultra Wide SCSI-IDE bridge is dedicate as general-purpose bridge of SCSI (Small Computer System Interface) to IDE (Integrated Device Electronics) interface. SCSIDE2.5W supports several platform and /or Operation System including PC and Mac platforms. With a 2.5" IDE hard drive installed into SCSIDE2.5W, it can be connected to SCSI host adapter and works as a standard SCSI peripheral. User can get the maximum benefits and high performance from SCSI Bus and IDE for devices. SCSI-IDE converter mounts direct on 40pin interface of the drive (harddrive, CD, CD-R, DVD, LS120, ZIP) and connects to any 68pin UltraWideSCSI controller. Fits direct behind any drive without extended parts, so that it fits together with the drive in standard 3,5" drive bays. SCSI-IDE converter mounts under any 3,5" IDE/UDMA harddrive and connects to any 68pin UltraWideSCSI controller. This space saving version could be used together with the harddrive in (the drawer of) standard IDE removeable drive kits. 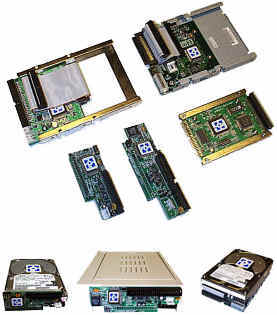 Complete IDE/UDMA33/66/100 harddrives with mounted SCSI-IDE converters and capacities up to 75 GB for easy installation in any PC, Server, Workstation, MAC or external SCSI Subsystems / enclosures. 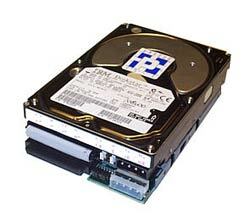 The SCSIDE harddrives can be used the same way as regular UltraSCSI or UltraWideSCSI harddrives. The large cache size from 2MB to 4MB offers higher datatransfer rates than many other regular SCSI drives. The converters are mounted under the drive so that the complete units could be used in the drawers from standard SCSI removeable drive kits. Highest, cost effective external SCSI capacites are available as external stations using integrated SCSI to IDE converters. These SCSIDE Stations are using IDE/UltraDMA 33/66/100 harddrives instead of expensive SCSI drives and can accomodate up to 7 drives in 5,25" drive bays. 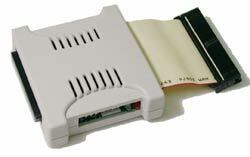 The SCSIDE Stations are available with UltraSCSI or UltraWideSCSI interface. Stylish units with translucent design are available for Apple MAC users as well. SCSIDE ExTerminators: The best solution for affordable high capacity SCSI storage!